DoingGroup is the industry's leading manufacturer of oil pyrolysis plant, and our design of waste plastic pyrlysis plant is also the most advanced. Waste plastics pyrolysis plant mainly includes reactors, oil and gas separators, oil tanks, and deodorant tanks. 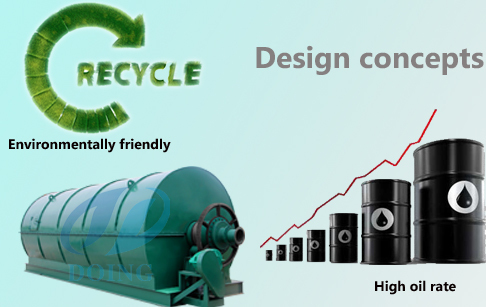 The design concepts of DoingGroup mainly has two basic principles: the largest oil output rate, and various emissions strictly comply with the European and American standards for environmental protection assessment!!! 1. Reactor using Q245R, 16mm standard boiler plate steel. The head adopts a curved design and has strong pressure resistance. The furnace body is designed with side slag to facilitate the emission of carbon black. 2. 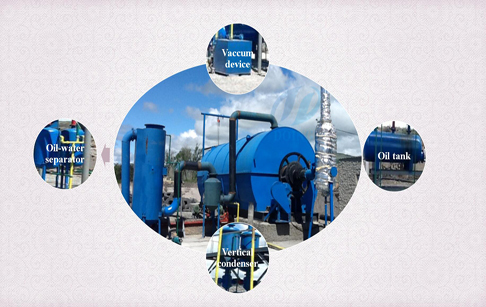 Oil and gas separators are used to remove water from the oil and gas and act as a filter. 3. The tank is used to connect liquefied heavy oil. 4. The water seal is a safety device that can purify the exhaust gas and prevent the backward flow of exhaust gas. 5. The vacuum device is also one of the safety devices. It can provide negative pressure, and increase oil yield. 6. The deodorant tank is specially used to remove HS2 gas, but also can remove some of other gas. This design helps the customer to completely solve the odor problem of the factory and make the exhaust gas meet the assessment standards of the environmental protection department. The customer's consistent high praise. If you wanna to get more details about Plastic pyrolysis plant design you can send E-mail to market@doinggroup.com. You can consult our professional engineer and specialized sales team with leave a message in below form.We will contact with you ASAP.You also can visit our factory in Henan,China.Get Detailed address.